097. SIR JAMES CLARK ROSS. Issued by J. Wix & Sons Ltd. (1937). 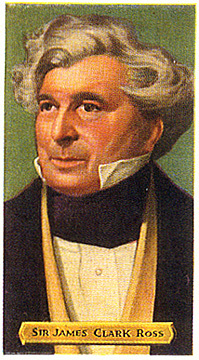 Card number 25 from a set entitled "Builders of Empire". Size: Ca. 2.78" x 1.6" (perforated edge). Recto: Portrait of Ross based on the Pearce painting. At bottom: SIR JAMES CLARK ROSS. Verso: BUILDERS of EMPIRE | A SERIES OF 50 | SIR JAMES CLARK ROSS | (1800 - 1862) | (National Portrait Gallery) | James Clark Ross entered the Navy, and in 1818 he accompanied his uncle Sir John Ross, the Arctic explorer, on a voyage to discover the North-West Passage. Between 1819 and 1833 he made five voyages to the Arctic, when he was the first to sight the South Polar Continent. He also discovered the South Magnetic Pole. He gave his name to the Ross Sea. The Ross Dependency in the Antarctic Continent, which is named in his honour, is the most southerly part of the British Empire. | NO. 25 | Kensitas - the MILD cirgarette | "Just what the Doctor ordered"